Linda from Crafty Gardener has alerted us to a new way to revisit some of our blogging blasts from the past – to introduce them to new readers and because some things are just worth repeating. This great idea comes from Happy To Design, who hosts links to reprises from bloggers everywhere. 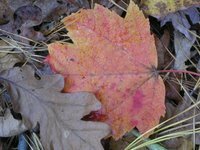 This post, written by Sarah, is the first we ever published on Toronto Gardens, way back on October 18, 2006. Hope you enjoy it! 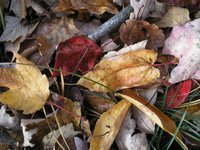 What is it about Canadians and dead leaves? The spurning of them, I mean. To my utter horror, I’ve just discovered that my new downstairs neighbour has carefully raked and stuffed into plastic garbage bags every single decaying leaf in the backyard of our shared garden. Imagine smoke coming out of the top of my head at a furious rate. This is not the first time. There was another neighbour. Another rake. And, as it was the neighbour’s mother who was the actual culprit it made things stickier. But more of that later. Few things make my blood pressure rise instantaneously – I mean that instantaneous clutching of your insides when something has been done that Shouldn’t Have Been Done. I don’t suffer from road rage, and generally only mutter sarcastically when someone does something idiotic in most arenas of life. The garden is different, however: when I saw those bags filled to bursting— with leaves I had been tending and amassing for years—I was fully ready to viciously throttle the perpetrator. I admit I have become a bit nutty about leaves. The more rotten and closer to becoming leaf mould, the better. But I as I garden in the city on practically pure sand I have good reason to be. My garden was once a beach of Lake Ontario. Some sort of geological happening, details of which I am unclear, caused the lake to recede further and further out and the beaches to remain behind.The end result is that many east-end gardens are pretty much pure sand, and mine is one of them. And I mean, real sand. Yellow, fine sand. Few things are actually happy growing in it. There’s nothing to eat. Water drains straight through. It’s a hard life, or a slow death in many cases. Yet, if enough organic matter lands on it and rots, becoming humus, sand can become soil. I’ve been doing my part in my little postage stamp garden to help this along. Soil does happen. Eventually. That, at any rate, was the alchemy I was trying to practice by allowing leaves to settle on my garden for years. Between earthworm action, (more on earthworm love later) and natural leaf breakdown, the soil is beginning to improve. By grabbing leaves and pulling them down into the soil, the worms create soil. 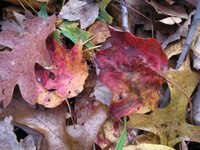 The more leaves sitting on the surface, the more earthworms, and the better it all works. I look back to the halcyon days in my garden before my first “Leaf Incident”. The days when my fellow tenants cared not a fig for the great outdoors. Their only garden requirement was a flat place to put a barbecue. They saw me puttering about back there and usually paid me no heed, except to say something like, “Looks like a lot of work!” My leaves sat, my earthworms ate, and all organic matter quietly rotted. Now I will tell you how my first Leaf Incident unfolded. The tenant apologized on her mother’s behalf and told me the story. Her mother was visiting her from Nova Scotia, and while her daughter was at work had wanted something to do to help. She had looked outside at the leaves on the garden and found them…..messy. 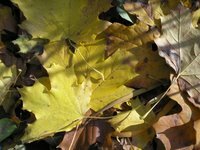 “Nobody wants dead leaves cluttering up the place.” She thought, “It’s lucky I came along!” She grabbed the rake and hoved to it. And an hour or so later, there was nothing but bare earth, a rake, bulging garbage bags, and a well exercised mother. Well this points out how different people’s mindsets can be. To this fine lady leaves equalled filth. While to me, leaves were life itself in the making. I’m happy to say, this point of view re: leaves does seem to be altering a bit, at least officially. The garbage men won’t even pick leaves up in green garbage bags any more. Unless they are earmarked for composting, and in special paper bags. No, no more leaves are going to landfill. In theory. But even with this welcome change, I still don’t want my leaves raked up. My leaves aren’t going to go to some community compost heap. Not my leaves. I want them right there where I can keep an eye on them, thank you. Glad you joined in on the Sunday Favourites. I enjoyed reading your post about the leaves. I too love leaves, leaves for the gorgeous colours, leaves to jump in, leaves to compost, and leaves to protect my gardens over the winter. First off, welcome to Sunday Favorites! Your post made me chuckle out loud! I can totally relate to the widespread abuse of fallen leaves. Once your are done admiring their beauty and playing in them, it's time to return them to the soil so they can bring pleasure to us again! Welcome to Sunday Favorites, my friend! Or should I say friend(s)? I see that you're delightful blog is hosted by both Sarah and Helen! Anyway, I'm just tickled pink to have you join in with the fun of Sunday Favorites…so very nice to meet you!!! I'll have to go and thank Linda over at the Crafty Gardener for telling you about our Sunday reprise! Ohhh my…I really did enjoy reading this story! And…it's really so funny because just a couple of days ago…I was just admiring our beautiful yard covered in autumn leaves! Now I must admit…that the admiration rose from the simple aesthetics of it all! I love the look and feel of autumn leaves covering the ground! I guess I have never thought about what they do for the soil…so I was very happy to read your story! Not to mention that this removes a bit of guilt for my husband who hasn't had the time to rake! I can't wait to tell him! Ohh my…I bet your neighbor will be sure to tell her mother not to rake when visiting in the future…hehe! Thank you again for joining in with Sunday Favorites…this was a great post…so happy to have you!!! We compost here on our ranchita! That's what leaves are supposed to do! I do rake up all/most of my leaves and put them in a chicken wire composter behind a hedge. In a year, it is so beautiful, my garden loves it. When I took a garden course at Merlin's Hollow in Aurora, David used to tell stories about taking peoples bagged leaves home to his garden. After a while, his garden got so big, he had the Aurora city deliver a dumptruck of leaves from their city sweeping. He composted all of them! Helen: Interesting Blog, enjoyed my visit. Don't all gardeners have a passion or love for leaves? It's part of Gardenitce, you know that thing that all gardeners have and there is no known cure. Read this post from A to Z. Great! I like the idea of recycling old Blog posts: so much less effort and otherwise they just vanish beneath the internet waves never to be seen again. Most of the time this may be a blessing I must go and investigate…..
Leaves, like all of us, have a destiny. It is the destiny of all of us to return to the soil and feed future generations. Leaves just do it much more elegantly than we ever will: they also smell much better at every stage of decay. While not everyone may have a passion for dead leaves, anyone who reads this surely will increase their love for them. So lovely. Thanks for sharing. Oh, soo right. The post is exactly point on. I so hear you on this…what is the obsession with vacuuming the grass that so many people seem to have?